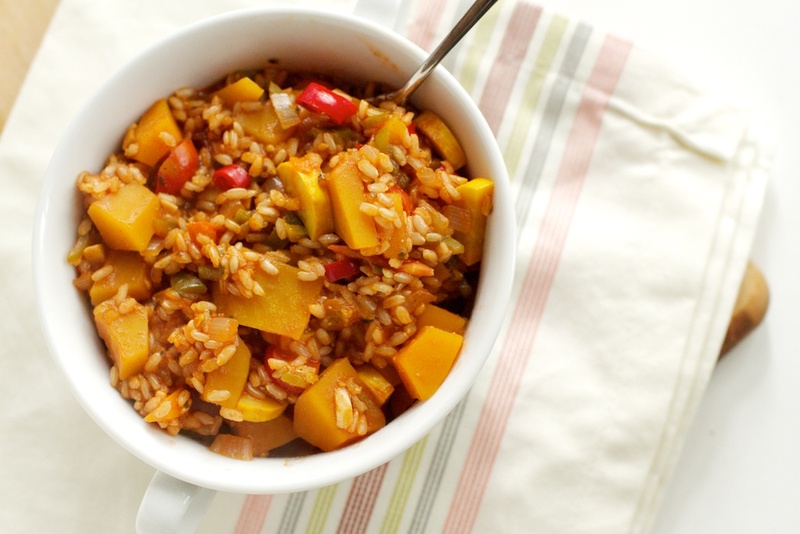 Butternut Squash Jambalaya (vegan) | Naturally. 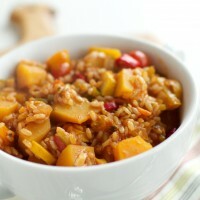 So, you may be looking at this post and wondering how in the world someone decides to make jambalaya vegan. I mean, most jambalaya recipes call for shrimp, chicken, and sausage. That’s a pretty big chunk of the meal missing by doing this vegan. Well this all started when my boss found my blog. At first he was outraged that I never mentioned I could cook and furthermore, that I had never brought any of my cooking into the office. It was at this point he declared he wanted shrimp jambalaya. Now, I let this pass because I thought he was joking. Turns out he wasn’t. He asked me a few times before I finally decided to make it. Fast forward a few days when I was staring a yet another butternut squash I bought (I feel slightly addicted….) Some how I connected jambalaya and butternut squash. Who really knows why I did but I am so glad I did. The original recipe is from Emeril, so if you feel cheated without the shrimp, sausage, and chicken, try his recipe. My boss said it was absolutely delicious! Haha I try to combine butternut squash with as many things as possible. Jambalaya seems perfectly logical (and seriously delicious!) to me. 🙂 glad I’m not nuts! My husband and I are newly vegan and are thrilled with this recipe. We used brown rice and found that we needed to add a 1/2 cup water and cook longer to soften the stubborn rice. The flavor is truly delicious. Thank you!! oh my gosh incredible! I can’t wait to make this fall!!!!!!!! 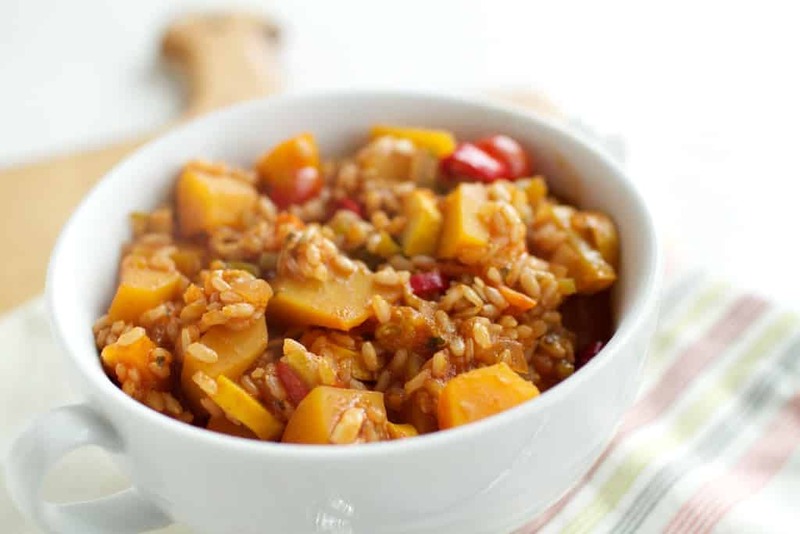 I love jambalaya, I love butternut squash and I can’t wait to try this. Though I’m not strictly vegetarian, I love to try all sorts of meatless foods and see what people can come up with, and this creative vegetarian dish looks absolutely delicious! I tried your recipe and it turned out great! I added some broccoli for some green color and it tasted wonderful! Thanks for a great recipe! Thanks for putting this recipe up! Like one of the previous comments there is not a huge variation for butternut squash recipes with most of the recipes consisting of soups, lasagna or risottos. So I decided to make this for the second time tonight because well its easy (one pot), full of flavour, adaptable and well just awesome! So as I didn’t have every ingredient in the kitchen I did make some changes 🙂 I made it minus the chilly sauce and onion powder, used a herb dried mixture instead of the two herbs, used chilly powder instead of the cayenne pepper and lastly used brown rice instead of white rice and more water. It was a mistake using the brown rice as it took way way longer! (so my adice is not to use brown rice unless you want to be over the stove for an extra 30min) I also added in some broccoli as suggested by a previous comment and in the end it tasted GREAT! Thanks again and if you ever do a cook book you must put this one in it! haha! If only I’d have read you’re comment before I also made the mistake of using brown rice thinking, “it’s more nutritional”. It is, but also took probably 1.5 hours to cook! If you want to use brown rice, I’d suggest cooking it separately and throwing it together with the spiced veggies. i just made this !! SOOOO TASTY i would recommend it to anyone. I didnt have paprika so I used cajun seasoning which gave it a extra kick. Thanks again for posting this. I made this tonight and it’s delicious! I didn’t have vegetable stock so I just used about 3 cups of water and it worked out well. Agh. I’m having a tough time with the recipe… Is the squash supposed to be cooked. How are the other veggies prepped, diced, minced, sliced… I’m wading through but have no idea what to do with this unwieldy hard to peel squash! Hi Julie, I’ve updated the instructions (my older recipes are a bit rough sometimes). There are different varieties of squash (some are easier to peel that others). If a normal vegetable peeler doesn’t work, use a knife and slice off the outer part. 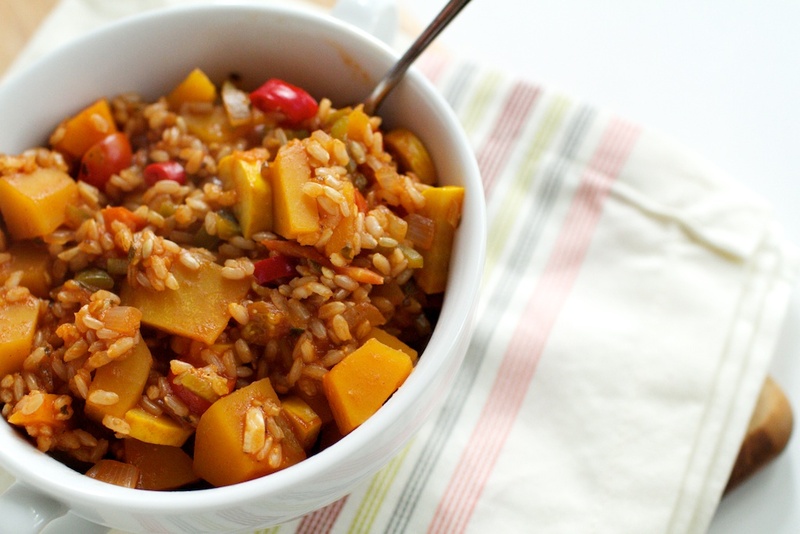 The squash will cook with the rice during the roughly half-hour cook time of the entire dish. Let me know if you have any other questions! I made this last night and it was great. I bought pre-cut butternut squash. The rice took longer to cook, but the result was great. Sounds delish! Think I’ll throw the whole thing in the pressure cooker, so the brown rice only takes 15 min. to cook – and the squash skin gets so tender it doesn’t need peeling. 🙂 Not sure it’s safe to say here what I think about your boss demanding that you bring food, especially (expensive!) food you don’t eat. Sounds a bit like an abuse of power, that. 🙁 Does Boss bring expensive food he doesn’t eat, for you? This stuff is on heavy rotation at our house during the fall/winter. One modification that’s worked well for me is to use 1/2 Arborio rice and 1/2 Brown rice. The Arborio adds wonderful creaminess to the dish. Although this recipie looks absolutely amazing I just thought I should say that a key ingredient in Worcestershire sauce is anchovies.. So this isn’t technically vegan :/ at least that’s what it is in the uk.. Not sure if it’s different in other countries! Worchestershire sauce has fish in it, so it’s not vegan/vegetarian friendly. You can get that umami depth with a splash of balsamic vinegar or some hot sauce instead. Hi Jim- Actually Annie’s makes a vegan Worcestershire sauce that is spot on (and what I always turn to). This was my first attempt at a jambalaya, Karolina. I was pleasantly surprised at how tasty it was! and hot sauce. i can eat rice I’m on a gluten free dairy diet cause i’m mildly allergic to gluten nd dairy. Sure, the recipe will work just fine but without the Worcestershire, the flavor won’t quite be the same. I added a can of red beans . Its was great .